Last year I had no produce from my gardening efforts. Why? Because mostly the slugs, native to our Pacific Northwest, ate, usually in one overnight, anything tender that tried to grow. This year I was determined not to grow my vegetable garden for the slugs to eat. This year, though, the weather decided to not to be spring when it was spring, to be only sort of summer with a periodic warm day, and here it is August and I can pretty much say there wasn’t much of a spring and summer this year where I live. So growing the vegetables was not going to be easy with neither the weather cooperating nor the voracious eaters – those slugs! Determined to persevere against the odds, I so thoroughly reasearched slugs, that I felt ready to take aim and do serious battle with the critters. And even with the delayed to non-existent spring weather, I was equally determined to grow a veggie garden this year. 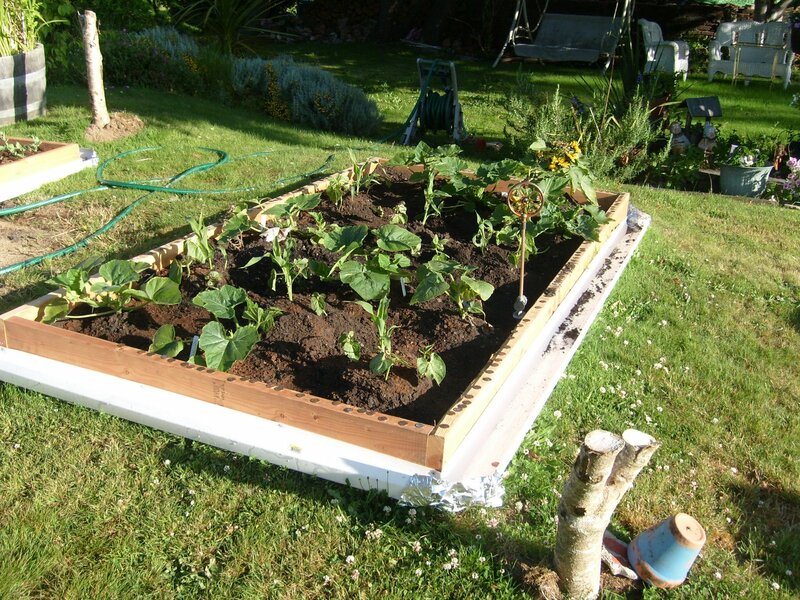 For the slugs; used several methods – bait traps, beer traps, copper pennies laid out along the top edge of the container boards, going out at dusk and spearing them. My knight contemplated the problem and came up with a unique solution. He built the container beds and then he nailed the ‘slug gutters’ to the outside of the container boards. I could fill the slug gutters with salt and any slugs daring to cross would not make it to the vegetables. That seemed to work quite well. I still set the beer traps – just in case. Result – we have growing vegetables which haven’t been eaten by the slugs. I think my knight has been very knightly about saving me and my vegetables from the slug eaters!